Get rid of credit card debts before you can save money. Credit Card Payoff can help you define your payoff goal and calculate monthly payment, savings in interest, and reduction in time of your debts. Find out how amazing it is with some little extra payment, you can get out of the debts in a short time and save a lot of money. 1. 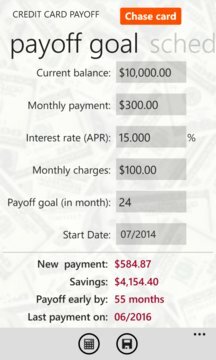 Calculate new monthly payment, savings in interest, and reduction in time, given a payoff goal in months. 4. Ability to save your debts for future reference.5. Ability to send credit card debt information. 6. 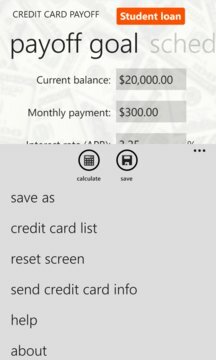 Live tile support to show your current credit card info right at the phone Start screen. 7. Many more features plus elegant design you need to check out to see.